Yesterday, I ran out of time for blogging, but you didn't think I wouldn't show you what I bought at Kantje Boord, did you? Or tell about meeting Melissa? She was arriving at the airport that very day and had to register for the marathon as well, so some proper planning was required. We drove to Kantje Boord and spend a quite a while exploring the store. Kantje Boord is not a big store, but they've definately made the most of the space. They stock just about everything you could possibly need to make lingerie, swimwear and things like gymnastic or ice-dancing costumes. 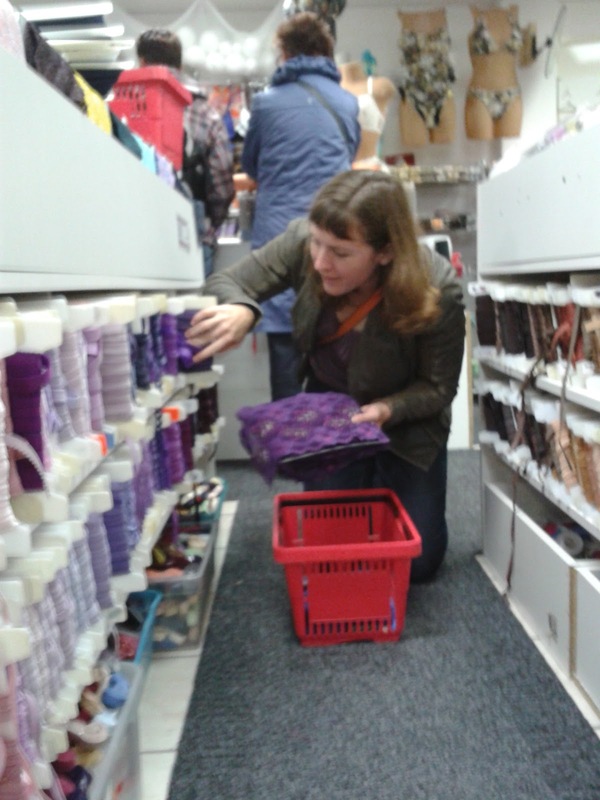 Here, Melissa is admiring the sparkly lycras on offer (she has actually sewn running gear with stuff like that). However, we both showed considerable restraint and only bought a more or less what we'd planned. Neither of us bought a kit, so we both spent quite a bit of time crawling along the bottom of the aisles to find picot elastic in the right colours. I bought only things to complement the red and grey/green I already have. 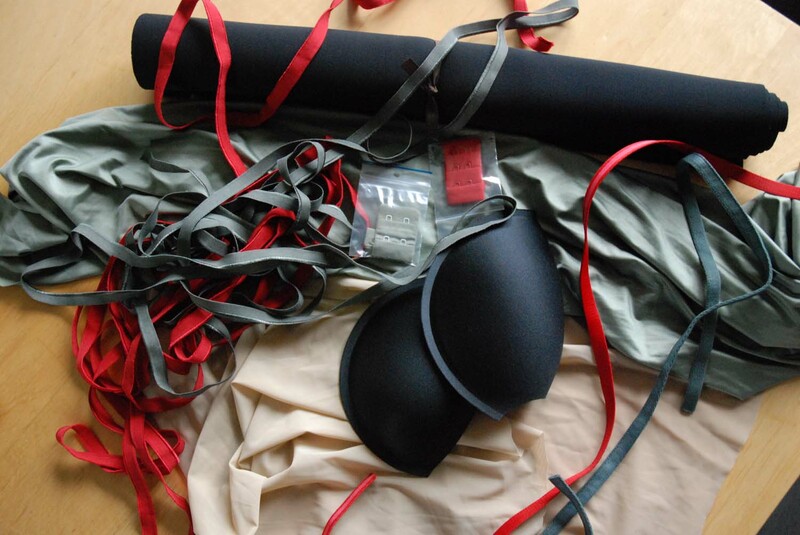 Oh, and foam cups and a roll of that neoprene-like stuff. The sign in the store called it "padding" so it is likely that it's actually intended for the purpose I had in mind for it (making my own foam cups). After the shopping, we had lunch at a local cafetaria and then I drove her to the old Olympic Stadium where the marathon would start on Sunday. It was good fun. To mention just one thing: how often do you meet anyone with whom you can play 'spot the Pattern Magic'? So, going in, it's quite a surprise to find this. I know I already showed you a similar picture which I took, but here you can see all that wonderful lace a lot better. Here's a close-up of those crazy sparkly lycras. And I did mention we spend a lot of time crawling around on hand and knees, didn't I? 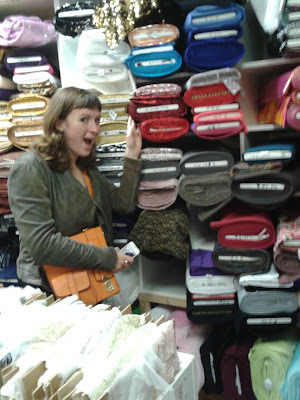 Here I am, looking for the right colour padding. I have yet to meet my blogging acquaintances... it must have been fun! Fun. I met up with Melissa when she was in NYC for a marathon day of fabric shopping.